Lock in any style, shape or texture you create until your next shampoo with this hotly anticipated protecting and perfecting mist, which 'remembers' and prolongs your hard-earned hairstyles. 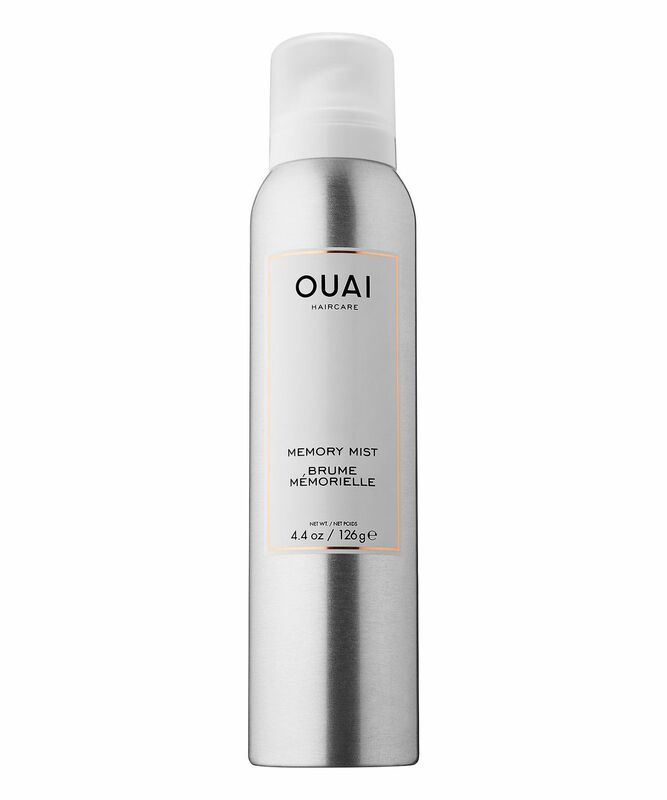 Featuring advanced memory polymer technology, simply spray onto damp or dry hair before styling to shield strands from heat up to 450 degrees and lock in your look – activate it with heat and the memorable, ravishing results are sure to go straight to your head. Boost your hair’s memory and lock in that hard-earned style with OUAI Haircare’s Memory Mist. A heat protectant and primer, this magical, multi-tasking mist locks in any style, shape or texture you create until your next shampoo. Featuring advanced memory polymer technology, this powerful yet utterly weightless spray means your hair will need less retouching or restyling and will suffer less damage. Simply spritz in sections onto damp or dry hair before styling to shield strands from heat up to 450 degrees and lock in your look. Free of parabens and animal testing, this cruelty-free miracle will give gorgeous results that are sure to go to your head. Mist lightly onto damp or dry hair in sections then activate with heat to lock in the style you wish you were born with. I have naturally curly hair and I used this to keep my hair straight after straightening it the night before, which normally I wake up and it was pointless even doing it. But after using this, my hair was still poker straight other than a little kink in my side fringe-which I'm not even mad about. I'm just glad I can save so much time in the morning and not look like Hagrids sister! I was really excited to try this product, my waves dropped out quicker with this product than without it. So disappointing. I used as advised and my hair felt so thick and kept getting knotted all the time after using. The product does lie quite thick in your hair leaving it feeling like you have several layers of hairspray on it. Not as I expected for the price. I don’t use many products on my hair, but as someone with natural curls/waves who liked to straighten their hair from time to time this looked interesting. Whenever I used to straighten my hair the next day there would be kinks and curls, but with this product they don’t appear anymore which is exactly what I want. I would say though it takes time to figure out how best to use it for your hair, if I miss a bit by accident, then it’s not effective. But that’s more user error than a reflection on the product. This makes all of my other styling products look like they have Alzheimer's! It's not sticky and feels really light on my locks, but it holds my style like it's naturally like that. So impressed! The important thing to know about this is it is NOT a hair spray, it should be used BEFORE any heat styling product, it does require heat to activate it.